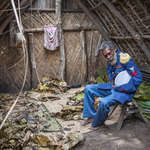 Cargo cults in Melanesia are focused on obtaining cargo (material wealth) from the Western World through magic and religious rituals and practices. 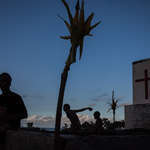 Cargo cult followers believe that cargo, which their ancestors intended for them, was unfairly taken by crafty Westerners. 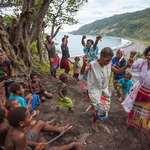 In the first part of 20 century many Melanesian cargo cults were building, big wooden aircraft, landing strips and bamboo control towers, duplicating white men’s rituals in the hope they would attract real airplanes with cargo to the island. This tradition no longer exists, but some elderly cult followers remember imitating American soldiers they had observed during World War 2. 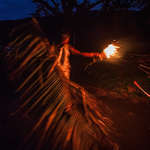 On Tanna Island in Vanuatu people believe in a mythological man called John Frum, who appeared in 1937. 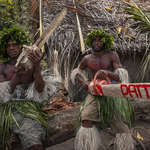 He told the islanders to go back to their old traditions and start to live in customary ways. In exchange for this, all locals would receive cargo. 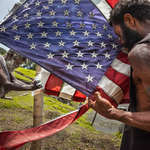 Every day in Lamakara village, cult followers raise an American flag, which symbolises power and material wealth that is still owned by Westerners. (According to the legend, John Frum was from America and it is thought “Frum” might be a distortion of the word “from”). 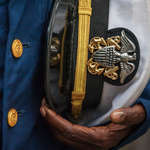 According to local myth, John should come back with cargo on February 15, so on this day, every year, the people of Lamakara wear US military uniforms given to them by tourists. 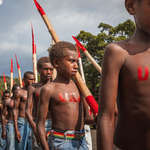 Many locals paint “USA” on their chests and backs and march with bamboo rifles in US Navy style. 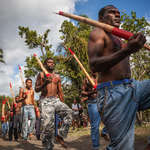 People from Yaohnanen village who follow another Tanna cargo cult, the Prince Philip Movement, don’t go to Lamakara for John Frum’s Day celebrations. They believe that there is another true messiah – Prince Philip, the Duke of Edinburgh – who they worship as a divine person. Legend says the Prince once left the island and traveled to a far-away country, where he married a powerful woman. 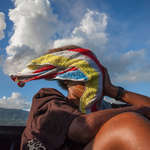 Soon he will return to Tanna, bringing to his motherland all the power and wealth of the British crown. 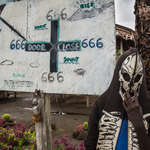 In Papua New Guinea, on the remote island of Bougainville in the village of Mewau, there is a cargo cult called Snake Tokii, also known as Cult 666. 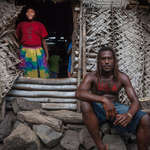 The locals believe that the island is entwined by a huge snake-god, Tokii, and when the snake moves, it causes earthquakes in Bougainville. 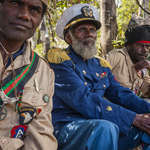 After the civil war (1988-1998) Southern Bougainville remained under rebel control and governed by King David Peii II. 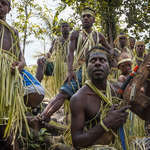 Cult members support Bougainville becoming a kingdom and believe that praying to their god will help them to achieve independence from PNG and wealth. 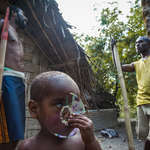 Mewau residents prohibit the use of alcohol and betel nut, but all the locals, including small children, smoke tobacco. 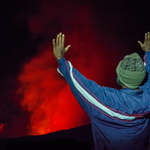 Cargo cults are dying out very rapidly and today it’s not possible to find people worshiping wooden aircrafts. 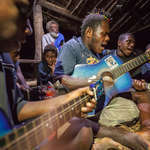 However, some PNG tribes continue to build wooden airplanes, helicopters and cars and use them during elections or special events when the local politician visits. 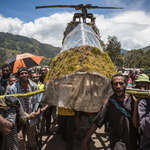 People believe that if they put a rich, powerful man in a wooden vehicle or a plane and carry him around, his all power and wealth will remain in the village and with its people. 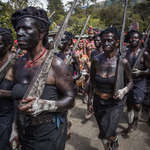 During such events, some of the tribes use military costumes and march with wooden guns, guarding the politician’s helicopter or plane. 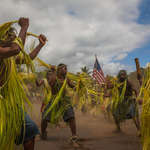 John Frum Cargo Cult followers during the everyday ceremony of American flag raising. For them, an American flag is a symbol of cargo. 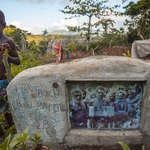 Lamakara village, Tanna Island, Vanuatu. Lamakara villagers paint USA on theirs chests and backs. 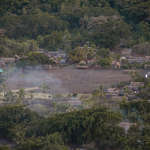 For many locals the US is a dream country from where they expect to receive cargo that was promised by John Frum.